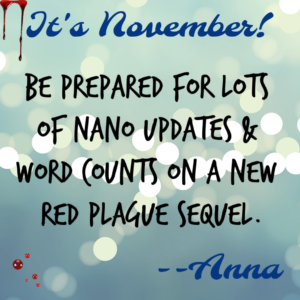 NaNoWriMo Day 28 — Novel Completed! 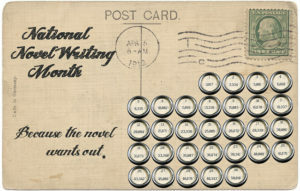 Or, I “Won” The National Novel Writing Month! Or, Almost To The Finish Line! Word Count Update on Day 26 ==> 44,000 and counting. I’m getting nervous about finishing Beasts of Vegas #3 because there is so little time left, but I’m trying to stay focused and squeeze words in whenever I can. On Monday afternoon I received one of the worst phone calls I’ve ever had. My 35-year-old brother, my only sibling, had suffered a brain aneurysm. After four days in a coma, he remains in ICU fighting for his life. Obviously, finishing NaNo has taken a back seat to making phone calls, driving two hours to LA every other day, and sitting in terrible waiting rooms. I remain at the 40K mark, but I don’t think I’ll make 50K by the 30th, and that’s okay. If you’re still in the race, good luck. I’m rooting for you.